Refer to Installation for advanced installation instructions. Have a look at some of the demo notebooks. 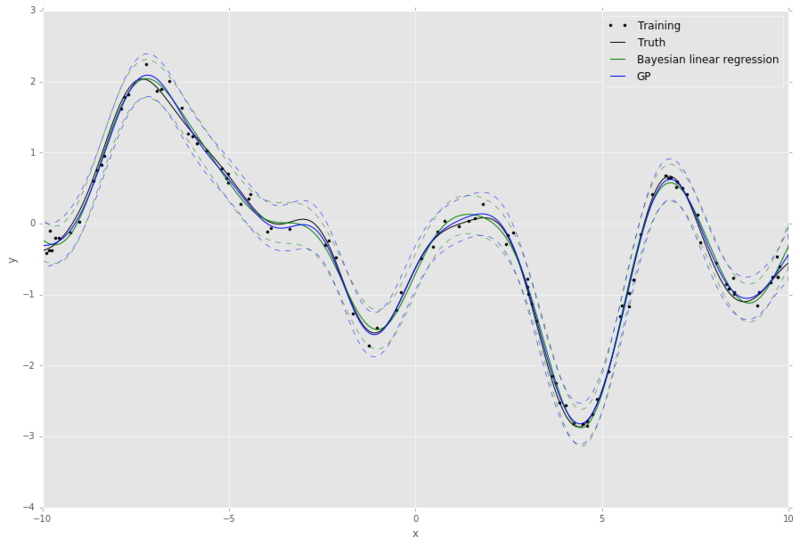 Here is a very quick example of how to use Bayesian linear regression (Standard Linear Model) with optimisation of the likelihood noise, regularizer and basis function hyperparameters. The default behaviour of the algorithms in revrand is to randomly sample and evaluate these hyperparameters before starting optimization from the best random candidates. This is because the objective functions may be non-convex with respect to these parameters, and in this way revrand can achieve some robustness to bad initializations. 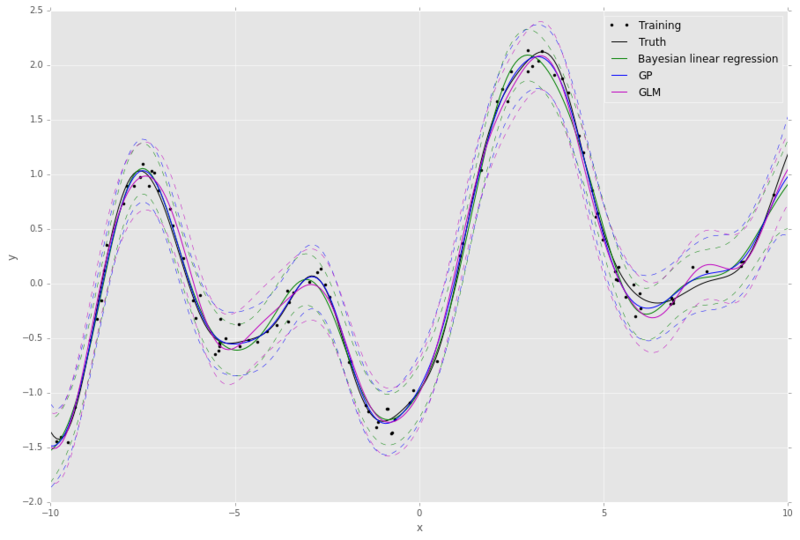 tells the optimizer it can use random starts with this hyperparameter, and to draw these random starts from a gamma distribution with a shape of 1, and a scale of 10. If random starts are not used, then the expected value (10) of this distribution is used as the initial value. Also, Positive() indicates the value of the parameter must be within (0, inf). See Bound and Parameter Types and Optimization for more information on how to use these random initializers. 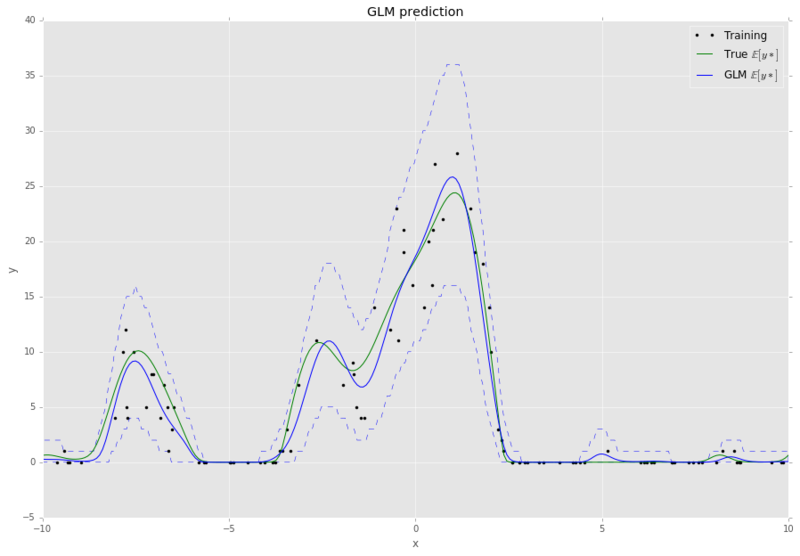 We can see the approximation from the GLM is pretty good - this is because it uses a mixture of diagonal Gaussians posterior (thereby avoiding a full matrix inversion) to approximate the full Gaussian posterior covariance over the weights. This also has the advantage of allowing the model to learn multi-modal posterior distributions when non-Gaussian likelihoods are required. Both LinearBasis and RandomRBF are applied to all of X, and the result is concatenated. LinearBasis has pre-pended a column of ones onto X so a subsequent algorithm can learn a “bias” term. RandomRBF is actually approximating a radial basis kernel function, ! This also outputs 2 * nbases number of basis functions. Hence the resulting basis function has a shape of (N, d + 1 + 2 * nbases). This is because the regularizer on the weights (the variance of the weight prior) is equivalent to the kernel amplitude parameters in a Gaussian process. Hence, in revrand we allow a separate regularizers per basis object. We can also use partial application of basis functions, e.g. Now the basis functions are applied to separate dimensions of the input, X. That is, LinearBasis takes dimensions 0 and 1, and RandomRBF takes the rest, and again the results are concatenated. For the moment we only support basis concatenation which is analogous to kernel addition. Performing kernel multiplication with bases is slightly more complex and we have not yet implemented it. Finally, if we use these basis functions with any of the algorithms in this revrand, the parameters of the basis functions are learned. where L is a diagonal regularizer matrix corresponding to our bases’ regularizer initializers. See  and our report for more information on this. Yang, Z., Smola, A. J., Song, L., & Wilson, A. G. “A la Carte – Learning Fast Kernels”. Proceedings of the Eighteenth International Conference on Artificial Intelligence and Statistics, pp. 1098-1106, 2015. Le, Q., Sarlos, T., & Smola, A. “Fastfood-approximating kernel expansions in loglinear time.” Proceedings of the international conference on machine learning. 2013. Rahimi, A., & Recht, B. “Random features for large-scale kernel machines.” Advances in neural information processing systems. 2007. Gershman, S., Hoffman, M., & Blei, D. “Nonparametric variational inference”. Proceedings of the international conference on machine learning. 2012. Kingma, D. P., & Welling, M. “Auto-encoding variational Bayes”. Proceedings of the 2nd International Conference on Learning Representations (ICLR). 2014.